With kids back to school, everyone indoors again and fall just around the corner, it is just about time to usher in the 2015-2016 flu season. The flu is a contagious respiratory illness caused by influenza viruses that infect the nose, throat, and lungs. It can cause mild to severe illness, and at times can lead to death (CDC Report). It can seem difficult to beat the odds this time of year and stay healthy but there are some easy ways you can limit the spread of flu in your facility and save money on the real hard costs of the flu: absenteeism, productivity and even employee morale. Limiting the spread of flu is not impossible if you arm yourself with the right information and enlist your Professional janitorial service in helping you. Hygienic practices by your employees and cleaning for health by your Office janitorial service or Michigan school cleaning service can significantly reduce your exposure during cold and flu season and save you money. Do your employees know how to reduce the chance of contracting common illnesses like influenza? And does your Restroom cleaning service utilize cleaning for health and other best practices to safeguard your employees and customers against the spread of the flu? In heavily trafficked spaces, people and communal surfaces paired with improper sick etiquette can spread illnesses with record speed and result in rampant absenteeism. Still, there are measures you can take to reduce the transmission of disease and preserve a healthy workplace. With flu season just around the corner, how can you work with your Detroit commercial cleaning company or Day Porter Services and your employees to combat the spread of the flu in your facility? 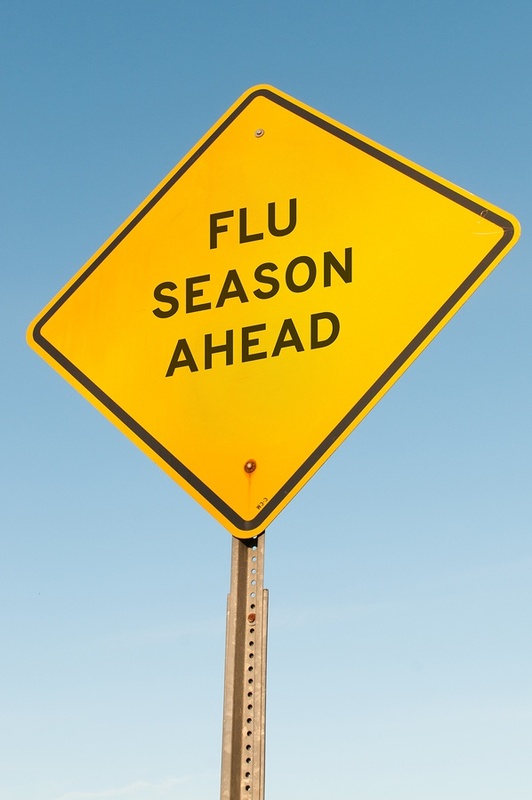 While the timing of the flu is generally unpredictable and can very from season to season, flu season begins in October and runs through May with typical peaks coming in the months of December and February. While the CDC (Centers for Disease Control) recommend a yearly flu vaccine for anyone six months of age and older, they also advised that you take preventative actions to avoid and reduce the spread of germs. We don’t yet know what this year’s flu season will be like as flu seasons vary each year with regard to timing, severity and length of the season. Most health professionals believe that flu spreads through droplets made when people with flu cough, sneeze or talk. When these droplets land on people or surfaces, the risk of transmission is significant. Likewise, a person can also contract the flu by touching a surface or object that has flu virus on it and then touching their own mouth, eyes or possibly their nose. What can you do to protect your employees, customers and anyone who steps into your facility? First encourage people to get vaccinated. While the flu vaccination varies in effectiveness, it is a good first step to safeguarding oneself from the flu. Second, remind employees and tenants that if they are sick, they should remain at home until they are symptom-free. Third, encourage proper hand washing. This can be through a reminder memo or even post proper hand washing techniques in your facility’s restrooms. Heavily trafficked facilities like offices and work environments where people share equipment and restrooms can provide the perfect high touch surfaces that viruses and bacteria just love. Proper hand washing reduces the spread of these disease-causing germs. Last, Because some people will still resist regular hand washing, work with your janitorial company or commercial cleaning company to make sure touch points are getting the attention they require. If your Building maintenance company or Custodial services are not familiar with the cleaning for health principle of touch points, you and your employees may be at risk for increased flu and other disease transmission. Touch points are objects and surface that see a great deal of different hands and fingers during the course of a day. “Touch points” like light switches, business machines, elevator buttons, stair rails, telephones, door handles, shared computers and other frequently used surfaces are disease-friendly petri dishes of bacteria and viruses. Touch points if cleaned regularly can help reduce the spread of disease causing germs and help you as a Facility Manager maintain a healthy work environment. Smart Clean and cleaning for health both encompass best practices by your Auburn Hills janitorial or your Commercial cleaning services. For instance, your Office cleaning services or Healthcare cleaning services may have germ-fighting cleaners and Green cleaning chemicals but are they using them effectively? Do you know that most germ and bacteria fighting cleaners have what is referred to as a “dwell time?” This means that the cleaner must be applied to a clean surface and then allowed to ‘dwell’ wet for a specified amount of time before being wiped off in order to actually kill germs and disinfect. If your Hospital cleaning service or Industrial janitorial services has great products but uses them incorrectly, they are essentially useless. A knowledgeable, professional Janitorial company with well-trained employees, understands the concept of clean first, sanitize second and will be trained in best practices to maintain a healthy work environment and minimize the spread of flus and colds. Applying these precautionary measures to safeguard the health of your employees and customers can help you sail through another flu season. Reasonable protective and preventative are both simple and effective. When you and your cleaning company work to maintain a healthy work environment, you can reduce the impact illness has on your bottom line. Whether you contract for Medical cleaning services, Medical office cleaning, general Office cleaning, Restroom cleaning, School cleaning or industrial cleaning, a knowledgeable Michigan commercial cleaning company can partner with you to effectively reduce illness in your facility this flu season.